Hey everyone, it’s time to change your profile……. You may have changed grades or even schools so you need to let My Learning Plan know. Please make sure you only choose ONE department – Example Grade1-3 OR Grade4-6 OR Art OR Elementary Special Ed TA OR Elementary Special Ed Teacher. You may choose multiple grades. If you’re teaching students in grades 10 and 11, choose those two options. Special subject areas may teach K-6. That’s ok – you may click on each grade level. One very important reason is that your request is routed to the proper administrator for approval. If you check multiple departments, it will go to ALL of those administrators. Another reason is that you will not see the proper workshops if you’ve marked the wrong department or school. If you are a traveling teacher, choose your home school as your building. Next week, I will be locking all profiles so this is something you really need to do this week. It will only take a minute. For more information on MLP, you can go to the MTRACT website from the district page and choose My Learning Plan. Thanks all – have a great day!!!! Well, we made it through the first week and look forward to a restful weekend. It is time to update your MLP profile if you’ve changed schools or grade level. Your profile determines the classes that are available for you. Please make sure you check ONLY your home school. If you travel, your home school is wherever you receive your paycheck. Log on to MLP and look at the bottom of the orange pane on your left and click on My User Profile. 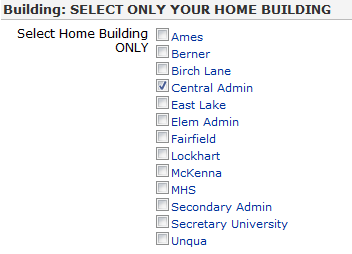 Click on the proper Home Building, Department, and Grade Level then click on Save at the bottom of the page. That’s it – you’re done! It’s been a while and I have a few things to tell you. The first is about in-service forms. You know how we’ve always had to fill in an out-of-district inservice request both on My Learning Plan AND in writing? Well, Dr. Fasano and I have worked it out so now you just need to submit it on MLP, then PRINT it and send to Dr. Fasano for his signature. That was actually the sticking point. The State requires his signature. I know it’s a pain to fill in all of your previous in-service classes but a shortcut would be to save them in Word and just copy and paste each time. I went to the NYSCATE Metro conference yesterday and learned some very neat things. One is a website similar to Thinkfinity that is a treasure chest of lesson plans and interactives free for our use. Another is a virtual world similar to Second Life but this one is a protected environment that is being purchased by BOCES for school district use. And then of course so many more Web 2.0 tools. I am going to work on highlighting a tool every other week so if you find any that you really love, please let me know!